Nar Shaddaa. I love the way the name rolls around in your mouth before you spit it out like a punch from a hyperspace cannon. If you had asked me what I thought this Friday’s Star Wars: The Old Republic would be, I would have guessed another timeline. What I didn’t expect to see at all, was another “planet”. I was not surprised, however, to discover that it was Nar Shaddaa. Smuggler’s Moon, Little Coruscant, or whatever you want to call it, Bioware has already made more than enough references to this shady world in their published materials to make me suspect that it would be included in SWTOR’s planetarium. Remember it from Knights of the Old Republic II? The Exchange and all that jazz? The fifth and largest moon of Hutta (another previously revealed planet), Nar Shaddaa is an ecumenopolis like Coruscant…except darker, trashier, and scummier. You can count on my Bounty Hunter being a regular here! On a more serious note, Bioware being the outspoken advocates of “decisions-that-matter” gameplay that they are, I’m predicting we’ll be seeing a lot of quests and storylines involving moral choices here on this world. The “glittering neon towers and floating pleasure palaces” of its top levels also bring to mind a bleaker, more twisted version of Vegas. 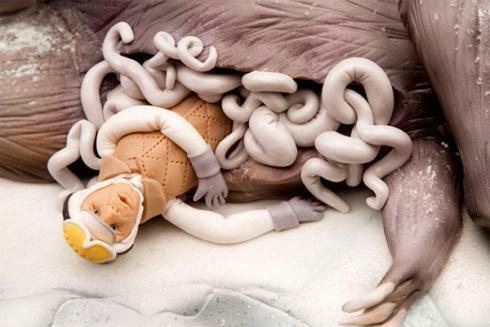 Its proximity to the Hutt Space capital has led it to become a criminal haven where all manner of illegal activities take place in its bowels. Anything illegal elsewhere in the galaxy can be sold, bought and traded here. 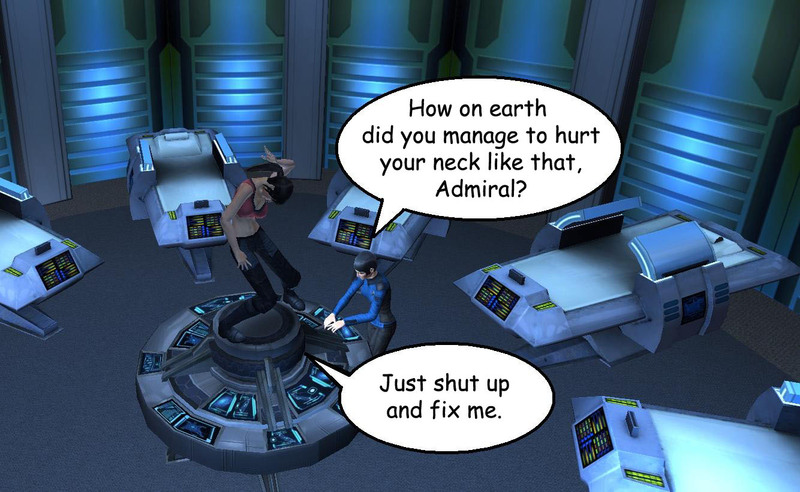 Guess complaining about the filth in the trade channels will take on a whole different meaning on Nar Shaddaa. With this newest announcement, SWTOR’s planet count now sits at a whopping 14! Not too many if you just take the number, but consider what Bioware has said about making each of these worlds “giant”, “massive”, “wide open” and “huge” (not to mention, check out the level of detail in this short video of Nar Shaddaa). Just how big is this game going to be? 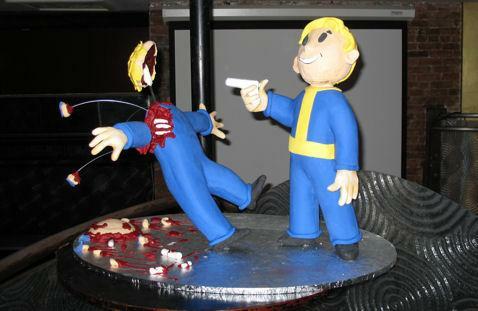 My mother sent me an email full of pictures of pretty cakes tonight (don’t ask). 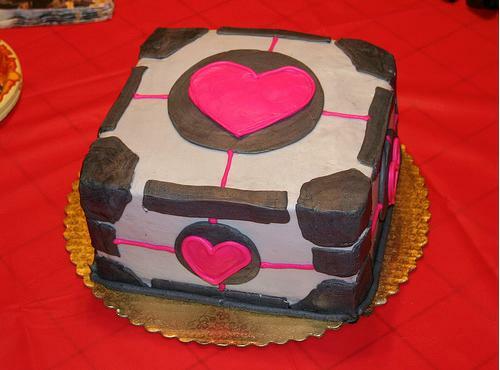 Bless that woman’s prim and proper soul, since it seems she’s into that kinda thing, I hope she didn’t mind that I sent her pics of these cakes for her collection. Now I’m just waiting for that “WTF” email to come back. STO: Not Another T’Andy Tour! 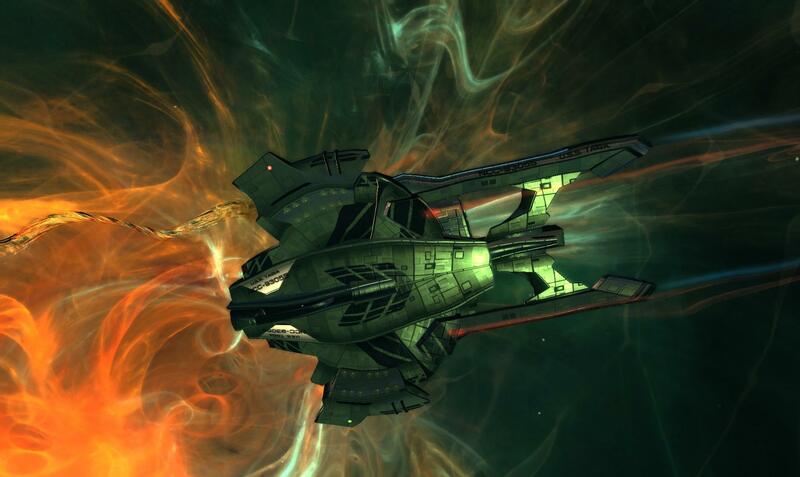 That’s right, the team that brought you “A Tour of a Klingon’s Bridge” and “Meet the Taiga Crew!” is back with its latest installment featuring the new ship interiors of Star Trek Online Season 2. 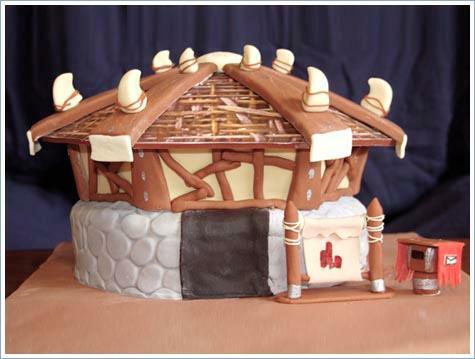 As a special treat, we are joined today by fleetmate Xerxes Khan of Combat-Archaeology.net. What do you say to a girls’ night in Xerxes? Come join me on the bridge, I’m about to start my workout. The tour continues on the Engineering Deck, where all the magic happens. 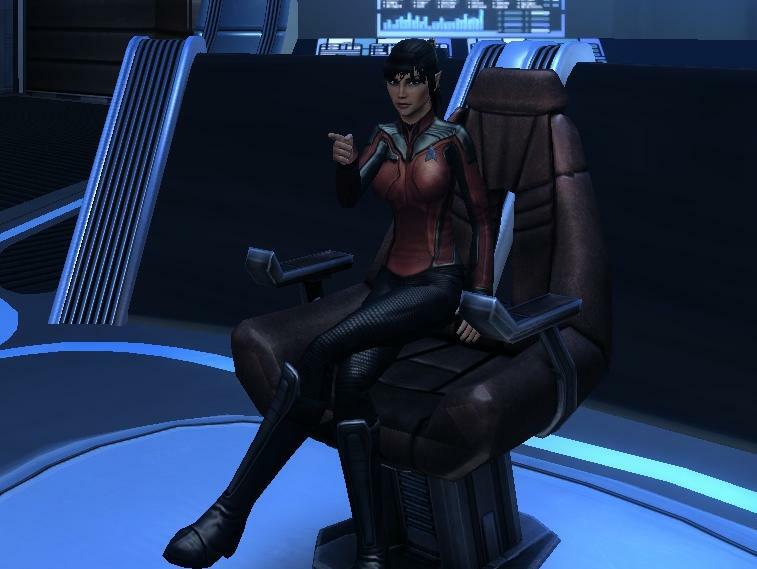 T’Andy takes her spot at the top of the platform and surveys the activities around the U.S.S. Taiga’s warp core reactor, making sure maintenance is up to date and everyone is doing their jobs. 2 days since our last accident, folks! Oh, wait…never mind. As Xerxes has so astutely observed, every raised platform is a dance floor in Admiral T’Androma’s eyes. Raise the roof! Every night is New Years Eve at Club Taiga! T’Androma decides to visit is rushed to Sick Bay next, to the intensive care unit. Sadly, no functionality here either. Come on, Cryptic, this one’s easy. It’s a sick bay for crying out loud! Now that injuries are in the game, wouldn’t it be neat if we could also treat them by interacting with a biobed? Following the Medical Aide’s instructions, the ladies take it easy for the remainder of the night. Back on the bridge, T’Andy and Xerxes relax in the newly installed Ready Room, where they give each other manicures and watch My Best Friend’s Wedding. Of note are the trophy shelves in this room (as well as in the lounge area) where the bridge owner can choose to display his or her ships and trophies, which can be earned through completing special missions and achieving accolades. There are only two slots in the Ready Room, but I would love to see more (come on, look at all that wall space!) Can’t wait to see more stuff like this for our ship interiors. The tour and the girls-night-in concludes in the Transporter Room, where we also bid farewell to our special guest. Good bye, Xerxes darling! Thank you for choosing T’Andy Tours(TM)! Good Bye Azeroth, Hello Outland! Stepping through the Dark Portal has never been so satisfying. Okay, so what if it’s like my eighth or ninth World of Warcraft character to do so? This time it’s special. You see, Miakala is my first Horde character to claim that honor. With her, I finally got to experience the full glory of Azeroth. I got to do new quests and see the other side of Horde-favored areas like the Badlands, Swamp of Sorrows, and Desolace. More importantly, I got to explore places like the southern Barrens, Stonetalon Mountains and Thousand Needles before all these zones get their major overhauls with Cataclysm. We all know WoW will never be the same once the expansion comes out, so it was fun to see things from the other faction’s point of view before all the changes can happen. I recommend anyone who hasn’t already done this to give it a shot. In some ways it was like playing the game for the first time all over again; not to mention, the process of leveling an alt is always going to be more enjoyable to me than endgame ever will be. Still, I have a feeling my Tauren warrior will be the last character I take through the old world before Cataclysm. I know I always say that the journey is the best part, but God knows I don’t have the strength nor the bountiful love for this game to take another one through 1-60 again any time soon. Good bye Azeroth, indeed. See you again after the face-lift. So now that I’ve completed my goal to see the old world content through a Horde’s eyes before it’s altered forever, what’s next? Well, I’ve gotten this far already so I see no reason not to press on…and I like the idea of having my first ever level-capped Horde character. Screw paid-faction-changes, that’s cheating! 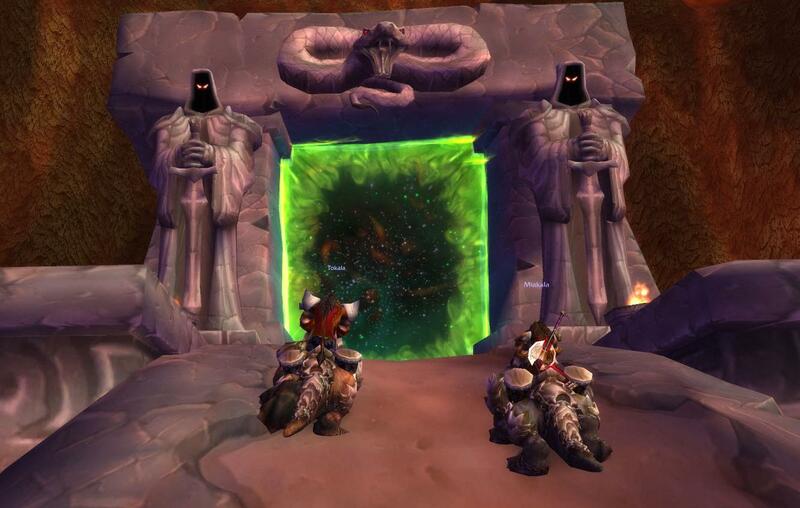 The Terrific Tauren Two are going to do this the old fashioned way, so guess it’s time to clear out the old quest log and onwards to Thrallmar (which, I was pleasantly surprised to discover, is just like a parallel universe version of Honor Hold)! Figures though, that the day I finally step foot in Outland, my fellow blogger and Silvermoon buddy Kaozz leaves it for Northrend with her Death Knight! So I’ve been in the United States for bit over a week now, still getting used to life in suburban NJ which so very different from downtown Toronto. No more police sirens blaring up and down the street all night long. No more sounds of drunken bums fighting right outside my window. And nothing is open 24 hours and within walking distance around here when it’s late and I don’t feel like firing up the car. I’ve been a city girl almost my whole life, so getting used to being away from the hustle and bustle has been the biggest challenge for me. Other than that, the US isn’t that much different from Canada. Of course, there are things I miss from back home that we don’t have here, or are very hard to find…things like like ketchup chips and Smarties, loonies and toonies jingling in my pockets, and hell, I even miss seeing French on the food packaging. And of course, I miss the Space channel. 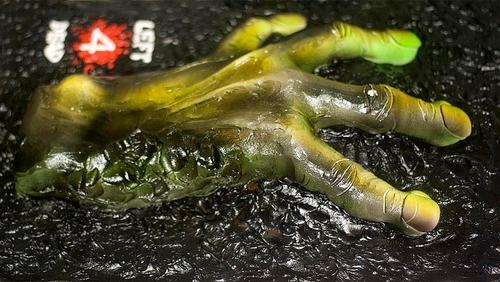 I’ve tried watching Syfy, but it’s just not the same (like why, pray tell, is there wrestling?) I still flip on the TV thinking, “Star Trek marathon!” every afternoon before I get settled down to work, and then I remember with a sad feeling that I don’t have Space anymore. Confound it all, where am I going to get my TNG, DS9 and Voyager fix now? And it’s weird because it’s 4am as I’m typing this, I just woke up, can’t get back to sleep and I’m feeling a little homesick…and strangely enough, I find myself wondering what’s on Space right now (just checked the online schedule — it’s their cheesy Slasher Movie Monday, so it’s Freddy vs. Jason). Space also has the best promos ever, and I just spent the last ten or so minutes enjoying some of my favorite ones on YouTube. Seeing as every commercial establishment within a ten-mile radius from me is closed at the moment, I couldn’t think of anything better to do to pass the time. And this is its superhero counterpart. Go kid Captain Canada. "We must acknowledge, once and for all, that the purpose of diplomacy is to prolong a crisis." -- Spock. Smart man. 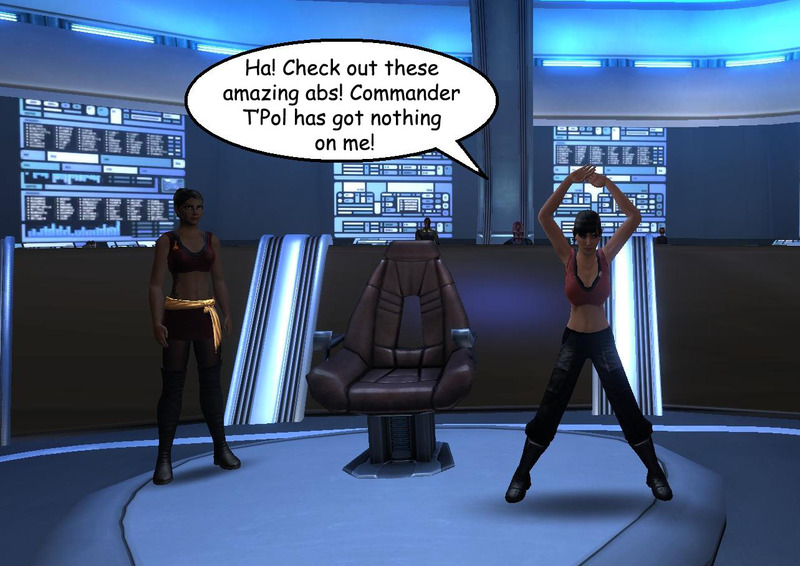 On the quest for the elusive “surprise” Tribble reward, my adventures continued this past weekend on the Star Trek Online test server. On Sunday, I delved into the mystifying and bureaucratic world of the Federation Diplomatic Corps. Two diplomacy missions down, failed both on the first attempts. 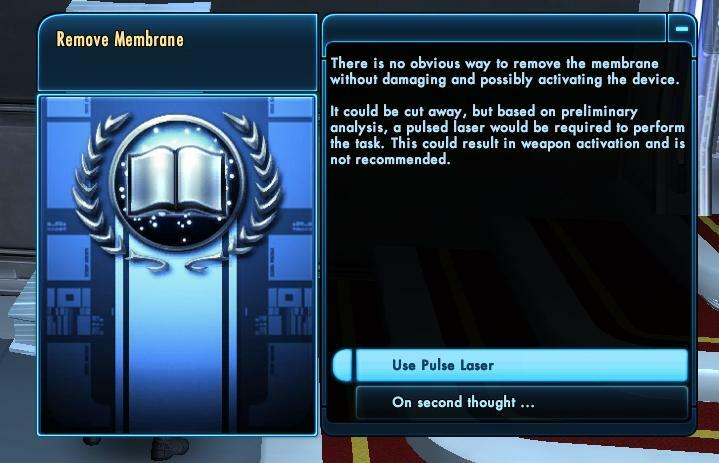 Dammit, my T’Andy’s a Vulcan and a soldier that likes things that go boom, how can you give her something like a Pulse Laser and expect her not to use it? So far, “leading with the olive branch” hasn’t been working out very well for my captain, but fortunately, if at first you don’t succeed, the missions can be restarted. So don’t panic, that war you accidentally started isn’t going to be permanent, and T’Androma should be sporting that shiny new ambassador suit in no time. I have to commend Cryptic for their efforts. Making it as a career diplomat is more than I expected. The two missions I managed to complete involved a lot of investigation, research, and running around talking to NPCs. 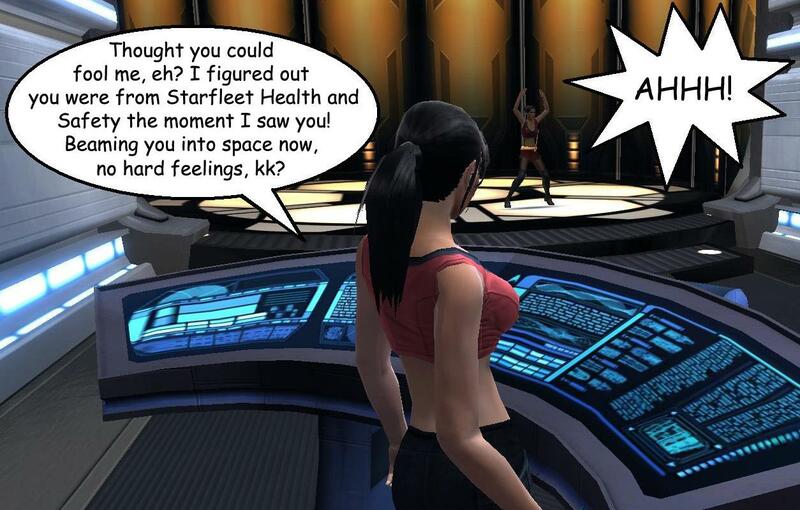 So brush up your MMO reading skills, Federation captains, because if my experience has taught me anything, you have to be pretty thorough and you don’t get much room for error. I’ve heard that these diplomatic missions can get pretty complex, so I’m prepared to be thrown into even hairier situations. My place. Tonight. You bring the Chateau Picard, I'll bring my usual Vulcan frigidity. How's that for diplomacy, or did I fail that one too? T'Androma, back in the captain's chair. 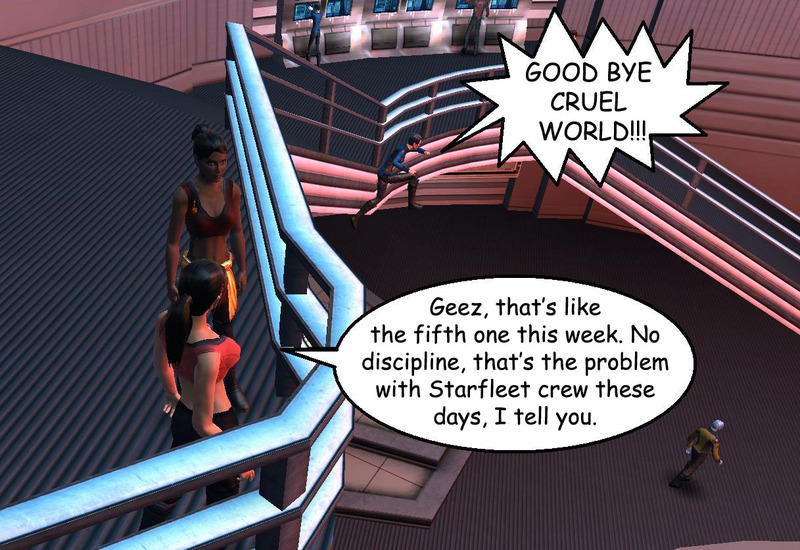 Yesterday, I reactivated my Star Trek Online subscription, as planned. I’d been waiting for a reason to re-sub, and Season 2 is it. The update probably won’t go live until closer to the end of the month, but I wanted a chance to update the client and get myself reacquainted with the game controls before that happens. 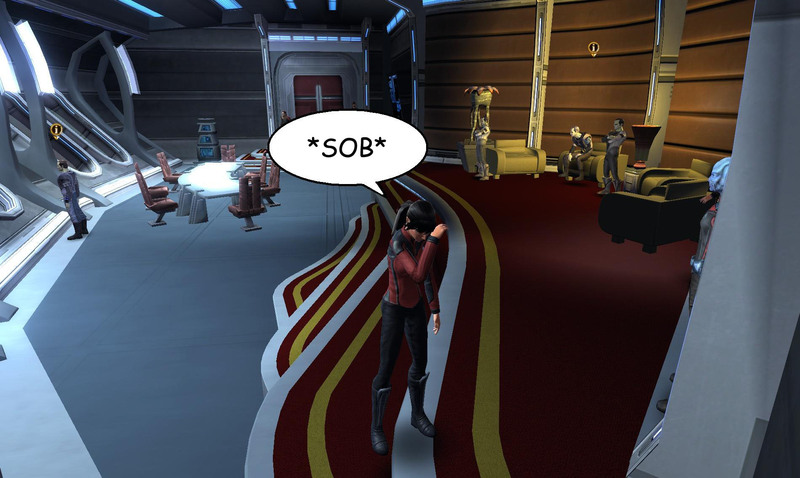 I hadn’t planned on logging into the Tribble test server — as much as I was looking forward to the new content, it didn’t make much sense to spoil it for myself before it even has a chance to go live — but the day happened to mark the beginning of another Tribble Test Weekend, and heaven knows I’m a sucker for free in-game rewards. I plan to test what I can without going overboard, and hope it’ll be enough to obtain the “surprise” Tribble. On the test server tonight, I had just enough time to start the first couple of Undine missions and fight my way to their native realm. And I have to say, I am absolutely floored by Cryptic’s take on Fluidic space — it’s beautiful, it’s enchanting…and just a little trippy. And just as I’d gotten used to the flight controls again, those sneaky “Trikes” and their new abilities give me a run for my money. I have a feeling the Undine story is going to be the most interesting one yet. Like someone spilled a little water into sector space. 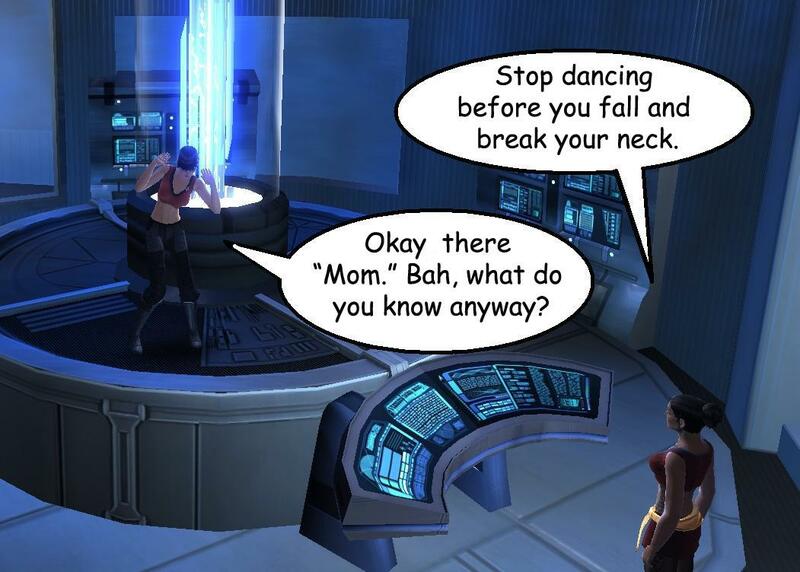 I am also truly amazed at how much the Season Two: Ancient Enemies update will be bringing to STO. 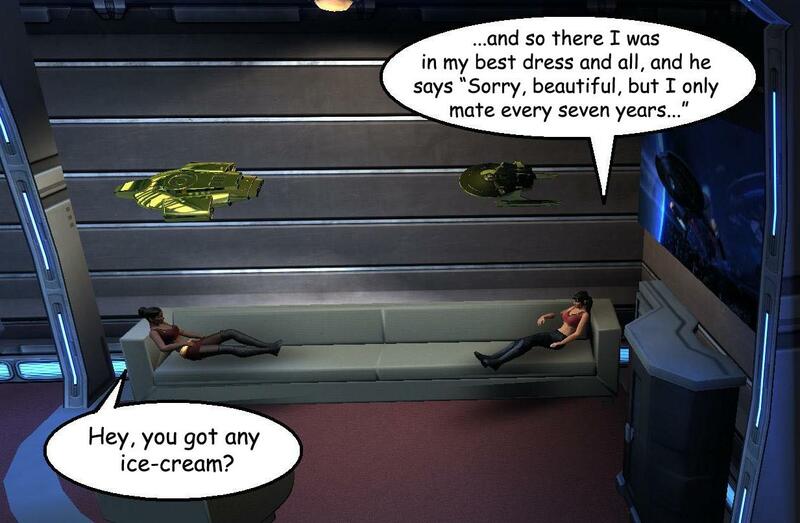 Tomorrow, I plan to pop into Tribble again to try my hand at some diplomacy. There’s more to life than running into a fight guns blazing, and it’s time for Admiral T’Androma to learn something about the delicate art of negotiation. Subtlety has never been her strong suit, so here’s hoping she doesn’t spark any galactic wars with her Vulcan candor. 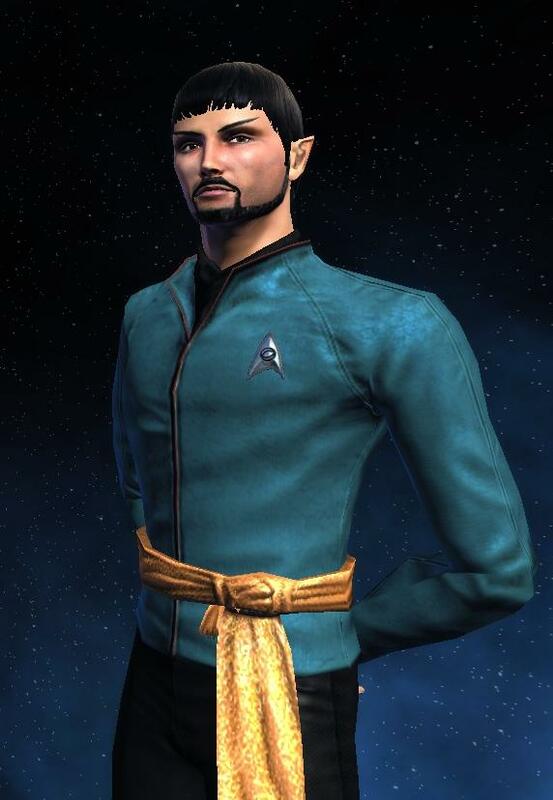 Finally, the beard and the uniform come together on the U.S.S. Taiga's First Officer. 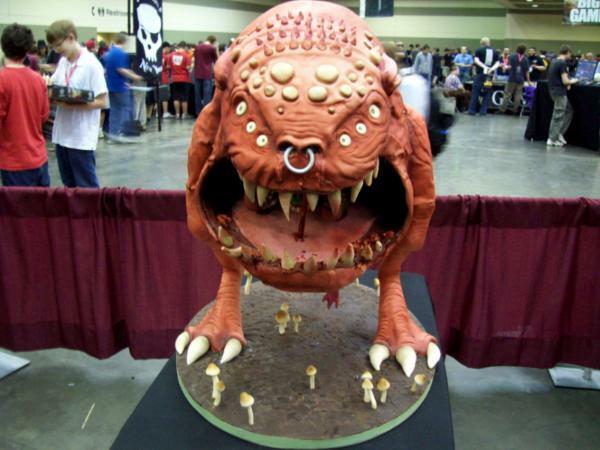 You are currently browsing the MMO Gamer Chick blog archives for July, 2010.